My squash plants look great so far this season but they have grown so tall and top heavy, with huge leaves, that they are falling over and breaking off at the base. I lost two last night during a rain storm. What's wrong and how do I correct the problem? 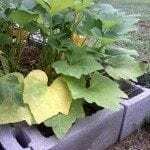 Squash plants are vines and should be growing along the ground. For those that have broken, cover the broken area with soil and keep it watered, they should re-root.